This basic website allows users to organize their Stack Overflow favorites by tags, or search through favorites by keywords. No specific license-- free for any use. Currently tested for compatibility on the latest Firefox, Chrome and Internet Explorer. For code, please refer to the GitHub page. On the "organized into Tags" page, it is necessary to click on the tiny "+" sign to drop down the questions for the particular tag. Perhaps it could be extended to the entire row? Also, when a search term is not found, there is no visual feedback saying "search term was not found" or something similar to indicate that the search did indeed complete but returned nothing. Would you consider adding tag search like in the S.O. search engine (surrounded by brackets like [python])? The tag browse feature you have is cool but sometimes I want to search for a combination of tags and terms. Actually, if you REALLY wanted to maximize utility, since I don't always remember what tags are on my favorites, how about doing this: when you currently list the pages under the tag after I click on it, list the other tags that are also included ON JUST THOSE PAGES. Then I could browse easily for any combination of tags I desire - just like using "related tags" on S.O. (I realize that would be hard to build though because you would have to nest it to an arbitrary length, so I would just love to have tags in search and maybe just a tag cloud or list of all the tags in my favorites so I don't have to guess at names). But anyway, these are just wish lists. I'm really really happy to just have a way to SEARCH! thanks again! Not the answer you're looking for? 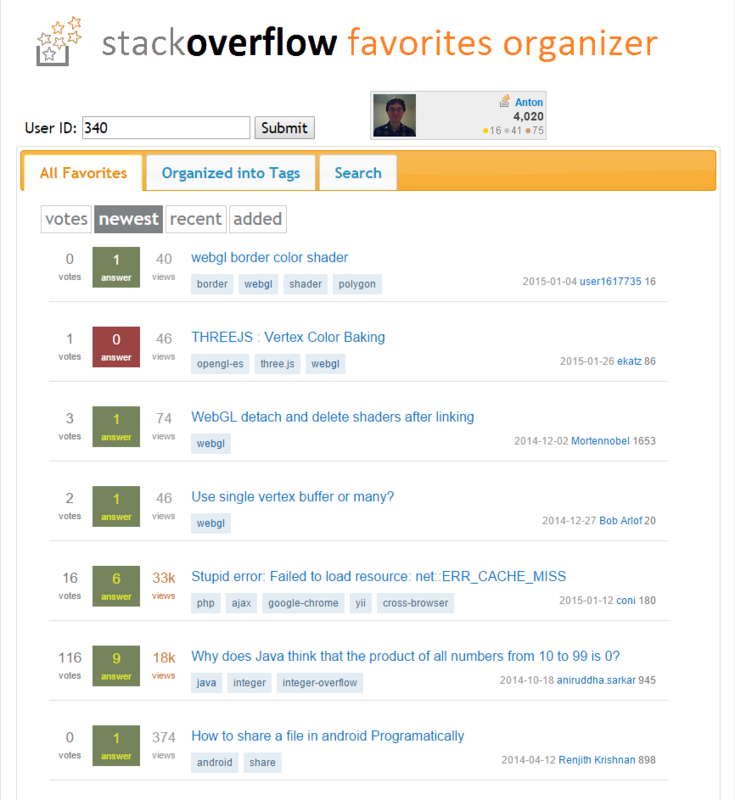 Browse other questions tagged app website stackoverflow favorite .